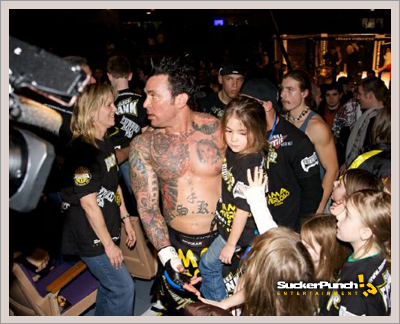 Although not happy with his performance Saturday night, Jason David Frank (former Green Power Ranger) came away with a win against Jonathon Mack in his much anticipated MMA debut. “I got caught up in his trash talk and played into his game” said JDF, “I’m usually very aggressive but I dropped my hands a bit when I got sucked into his game and he caught me with a good shot to the chin”. Frank went on to say, “I felt my legs get wobbly and I kept thinking to myself, I can’t go down, I can’t go down”. A hesitant Mack went in for the kill just as JDF was able to get his faculties together and the fight went to the ground. 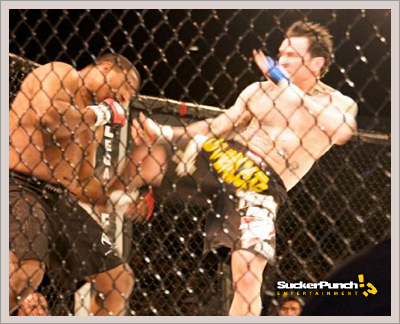 “I know I’m known for my striking but I was very comfortable when I got to the ground, I went for an armbar but ended up getting the omoplata”, said JDF, “I’ll do much better next time I promise”. Regardless if you are a fan or a hater you have to give credit where credit is due. This man put himself way out on the line by promoting this fight on a national level, and stepping into a cage with a bigger opponent in a sport where anything can happen. The pressures of knowing you have life long fans who view you as a childhood hero, to having the ultimate haters wanting to see “the Power Ranger” get his rear handed to him, Mr. Frank stepped up and got the job done. Oh yea, JDF won, i wasglued to my computer on thecagedoor.net live coverage page, refreashing, refreashing every time to read what happened. After i read that he performed the omoplata after being taking down, i couldn’t help, but smile every time. Awsome job Jason, thats what mack gets for making fun of you. Right on, right on. Congratulations, Jason. i think you did a good job, jason. i am impressed with how you did. good luck in the upcoming match. JDF is an amazing person. So glad he won the fight. Looking forward on catching his next fight! YEAAA JDF you killed that sucka and made him tap!! Jason won his 2nd fight by TKO (punches) congradulations!!! cant wait for the next one, and keep those hands up !!!!! i think some people are dumb for thinking you can’t hold your own in an mma ring, jason. they are idiots for thinking you can’t hack it just because you were on power rangers. Idiots. ben fan sense i was 13 power rangers rule! !kick that mother fucker like a putty!!!metal! !